Wedding favor DIYs are a great way to commemorate the love you share with your bride or groom and include your guests in the celebration. Give your guests something to remember your wedding day celebration with one-of-a-kind, handmade wedding favors like sparklers tags. By creating them yourself, you’ll add your own special touch, cut costly expenses and make your wedding even more memorable. 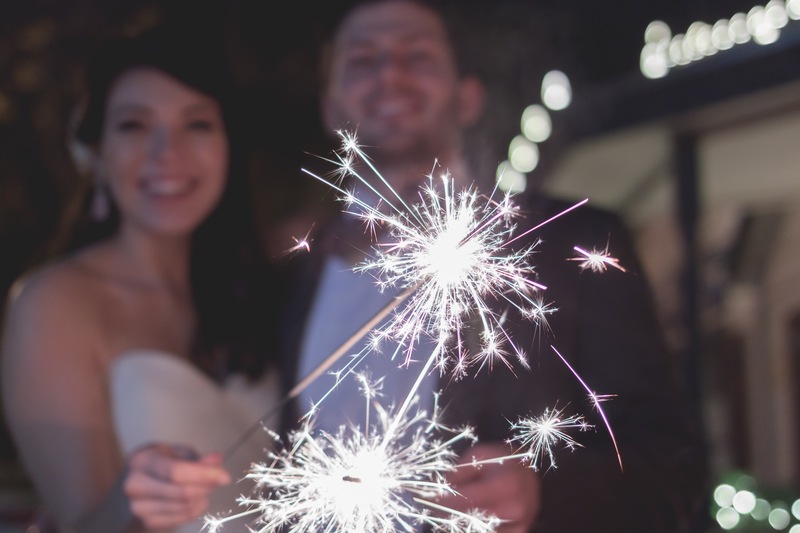 With wedding sparklers, you’ll get to include guests in lighting up the evening with love. Order your favorite wedding sparklers in bulk, then package them in customized envelopes or covers catered to your tastes. We love using the phrase, “Let love light the way.” You can also include your new initials and wedding date. A delicious way to treat your guests, pie jars are exactly as they sound. With a little time, pie crust and baker’s magic, you can create little jars of your favorite pies for your guests to take home. Top it off with cutout hearts made of crispy, crust to make it even more romantic. Love is ‘brewing!’ Custom tea and coffee blends are sweet gifts for your guests. Purchase cardboard envelopes or boxes to place loose leaf teas or coffee grounds in. Stamp your favorite romantic phrase on the outside, wrap with ribbon and place in tins through your venue for your guests to take home. With a little DIY and time, share your fairytale romance with your guests through photographs pressed onto drink coasters. Choose from your favorite engagement photos, places you’ve visited, where you had your first date and more to give your guests a variety to choose from and take home. Let love grow in abundance when you use small succulents as wedding favors. You can purchase succulents at prices within your budget, plant them in ceramic jars with your guests’ names painted on them, or even place a little note card on them to help guests find their seats. Send your guests home with a few goodies to help them recreate your signature cocktail. For mojitos, you can choose small mint plants to pair with little containers of simple syrup. Don’t forget to include a recipe card! Get guests involved in creating their own wedding favors by setting up an endless candy buffet at your reception. You can even order candy that fit into your color palette and create chalkboard labels for each of the candies. You’ve worked tirelessly to create the perfect ambiance at your wedding, so allow your guests to bring it home with them. Combine your favorite scents with melted candle wax before pouring the mixture into baby mason jars. Create a delectable sweet and savory mix of popcorn to celebrate your beloved ‘popping the question.’ Pop enough popcorn for small bags to distribute to your guests, then spread the kernels evenly over wax or parchment paper. Drizzle melted chocolate, caramel, peanut butter and toffee bits over them, let cool, then package for your guests. Giving thoughtful tokens of appreciation to your guests doesn’t have to be expensive. These are just a few ideas to help get you started. Whether you opt for beautiful wedding sparklers that shine as bright as your love or home-baked cherry pies, we know your guests will appreciate the small gestures.